I went to Brussels a few years back (and blogged about it) and had lambic beer for the first time. It is traditionally brewed in only a few places in Belgium by spontaneous fermentation (from the medley of wild yeast in the environment of the brewery and not from carefully controlled yeast strains), taking several years to make, and has a distinctive sour taste (maybe more winey than beery). Often flavored by fruit, the authentic stuff adds real, whole fruit with a secondary fermentation. The imitators add sweeteners and syrups. Here's a good article I found on lambic, and here's the wiki page. Some of the best of the real deal comes from the Cantillon brewery in Brussels. Thankfully, it is acquirable in the U.S. The most commonly found 'lambic' in the U.S. is Lindemans. It's dangerously yummy, but if you've had Cantillon at the brewery in Brussels, you will immediately know that Lindemans' not the real deal. It's sweet, never sour. Given the complexity of the lambic-making process, blending and aging is as important as the spontaneous fermentation. Hanssens Artisanaal is a blender -- buying lambic from brewer before fermentation takes hold and aging and blending in their own cellars. 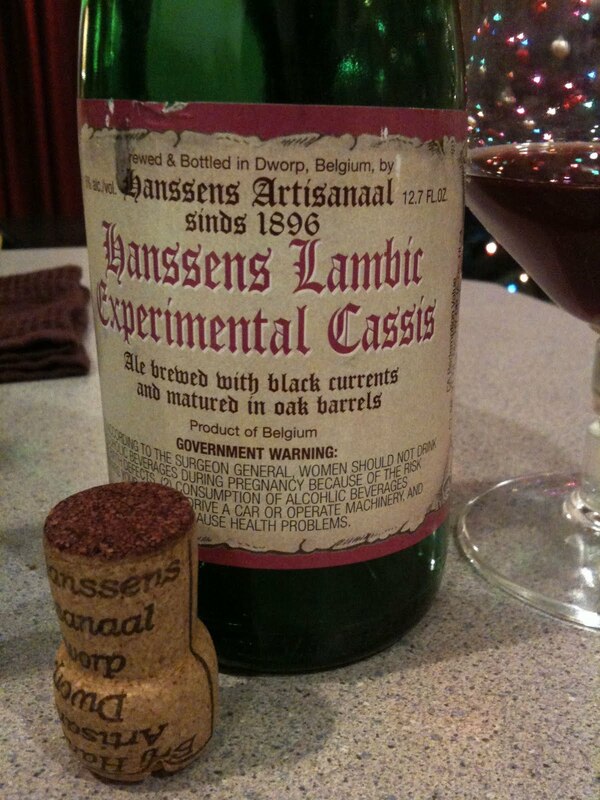 Which brings us to the beer in the photo: Hanssens Artisanaal's Experimental Cassis. A friend found it in a local liquor store. Fruity, sour, dry, with little aftertaste -- it's great. Here's the Beer Advocate listing. All of the reviews which rate it below an A are written by idiots with no taste buds. Unfortunately, 'lambic' isn't a protected term like 'champagne,' so anyone can slap 'lambic' on the label and there's no way to know. And I've had some really authentic tasting 'lambics' that were made in the USA (so they couldn't have been the 'real thing' by Cantillon standards). Come visit us in Boston, and we'll have a lambic binge!